Donation of 20,000 Euros to rebuild areas hit by the recent floods in Germany. The floods in June 2013 have caused widespread damage in large areas of Eastern and Southern Germany. Immediately after the floods, Charity Cat asked for donations and put up donation boxes in the Headquarters of PUMA in Herzogenaurach. Thanks to generous donations we were able to give 20,000 Euros to the non-profit organization“Habitat for Humanity”. 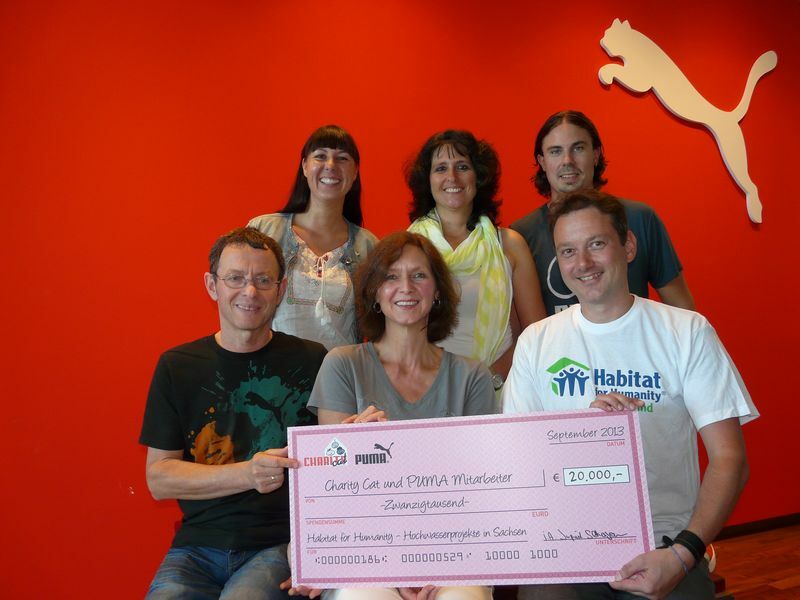 Overall, PUMA employees and the employee representatives of the Administrative Board donated € 2,500. Charity Cat rounded this amount up to € 5,000. PUMA’s Management provided an additional 50,000 €. What will the donations be used for? € 20,000 will go to “Habitat for Humanity”, who will use the money to organize and finance the rebuilding of the pre-school “Ringethal” and playground “Neudörfchen” in Mittweida as well as the pre-school “Kinderoase” in Crimmitschau (Saxony), which were destroyed by the flood. The remaining donation monay will be used for similar rebuilding projects. Charity Cat is looking forward to any suggestions from you.